Molly and Riley Osmon, Bedford, Ind. It all started when Molly Osmon, then 11, took a hand-drawn flier and knocked on her principal’s door. She asked if her school, the 215-student Springville Elementary outside Bedford, Ind., would host a small fundraiser for Riley Hospital for Children at Indiana University Health. What the event became, though, complete with a carnival, food trucks and silent auction, would reverberate throughout the Lawrence County community and beyond, setting a single-event Riley fundraising record for Indiana elementary schools and helping bring a state-of-the-art cancer treatment to Indianapolis. Molly’s motivation was personal. Her younger brother, Riley, was diagnosed with pre-B acute lymphoblastic leukemia in 2013, just before his second birthday. Molly was 6 at the time, and grew up as her brother underwent chemotherapy, had multiple surgeries and spent more than 300 days at Riley Hospital. Riley’s type of leukemia was considered very treatable, and his first year-and-a-half of chemo went smoothly. But in 2016, he relapsed, and then developed a near-fatal lung infection. In March 2017, Riley relapsed for a second time. CAR-T is short for chimeric antigen receptor T-cell therapy. The newly-approved, game-changing treatment that modifies patients’ immune T-cells and turns them into “ninja cells” designed to seek and destroy the cells where the leukemia lives. Trials found that more than 80 percent of patients went into remission within a month of beginning treatment. With help from her family, school staff and the Riley Children’s Foundation school fundraising program, Kids Caring & Sharing, Molly organized the Be Brave and Beat Cancer event. The community turned out in a big way. The event shattered expectations, raising a total of $22,000. It was the largest single-event fundraiser by an Indiana elementary school since the Kids Caring &and Sharing program began in 1985. During the 2017-2018 school year, 540 schools throughout Indiana raised $2.6 million through the Kids Caring & Sharing program. Director Susan Miles describes it as a “giving for giving’s sake” program―there are no prizes for donating; schools simply get a wood plaque to mark their participation. 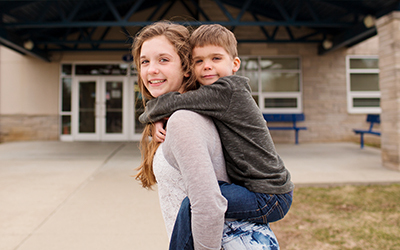 “What I find so interesting is that Springville Elementary had never raised money for Riley before, but when a fifth-grader came to them with the idea, they realized that this was a way that she was processing what was happening with her family,” Miles says. Meanwhile, Jodi Skiles, M.D., a Riley Pediatric Hematologist/Oncologist who serves as Director of Pediatric Stem Cell Transplantation, had already been working with her team to bring CAR-T to Riley Hospital. They needed just $20,000 to move forward. Today, Riley is 7 years old and in first grade. Recent blood work detected a few B cells, where the leukemia lives in his body. It doesn’t necessarily mean his cancer is back, but his doctors say he needs more monitoring and possibly another CAR-T infusion. Click here to learn more about our Kids Caring & Sharing program.